Technology is not just computers! Interactive, hands-on, educational programs with a scholarly bent. Specially designed programs for exhibition, residency, workshops, and classes for schools, museums, community centers, families, teachers, makers and artists of all ages. Alchemical Tech offers an active and interdisciplinary approach to artistic pedagogy through exhibitions, interactive installations, lectures, and hands-on workshops. 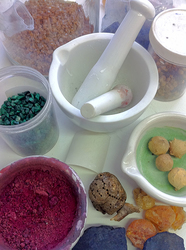 Alchemical Tech makes connections across art, history, science, culture, and the environment through the transformation of raw materials into natural dye and paint. Alchemical Tech activates learning across disciplines using skills-based, historically-oriented, hands-on art making as catalyst and connector. Programs are custom-designed for any institution or community, and for all ages from adult and professional to pre-K. Focus ranges from artistic, historic, scientific, cultural and environmental. From engaging science and the environment in the alchemy of raw materials transformed into tools of creation, to math through the measures used in paint and ink recipes, to history through the development of material culture, and the ways this culture is expressed through the arts, this project shows a new way to look at the material of the world through the lens of art-making. Download a brochure at top right of page. Patricia Miranda has been offering workshops and programs for more than fifteen years. She exhibited the Alchemical Tech project at Maker Faire New York 2013 and 14. Alchemical Tech was selected as an editor's pick of Make Magazine. For more info on the Maker Faire exhibit, click here. Check out How.Do videos of the exhibit here and here. For inquiries regarding Alchemical Tech, contact us via email.